'A walk in the Wutong Mountains'. A Walk in the Wutong Mountains visually describes just that - a walk (or a series of walks) I made in the beautiful Wutong Mountain range above Shenzhen in South East China. I was lucky enough to have been awarded a fully supported residency for a month at the Da Wang arts centre which is idyllically situated in an area of great natural beauty surrounded by the Wutong mountains. Each day I would take a circular walk through the the hills, at the end of the day the earth rich in iron would glow a brilliant rust red as the dying rays of the sun hit the ground; I have tried to capture a sense of this in the painting. The piece also references the deep significance of the circle and the square in Chinese culture; the former representing perfection and unity and the latter representing order and regularity. 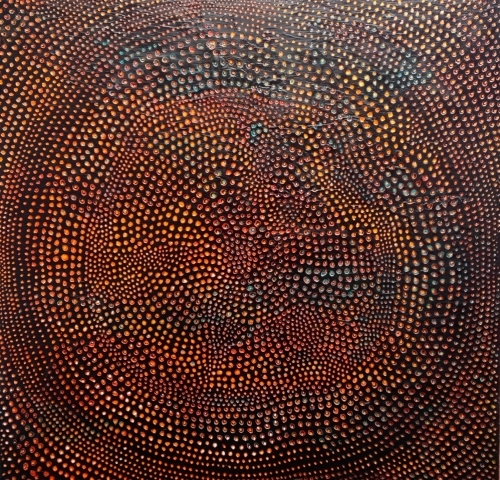 The construction of the painting is thus circles within circles, within circles all contained within the square.